Our Net Zero Off Grid Prefab Hears Solar Power Is Not Sustainable, Ha! Good morning with a giggle from the Off Grid Prefab House! "Solar panels are not sustainable, Millennials. May sound good, yes. 'Clean, renewable energy.' But what do you do when the sun's down at night? What do you do when the clouds obscure the sun? We're not there yet." Ahhhhhhhhhh WHAT? First I laughed and laughed... Oh, poor guy, there's this thing called science, and battery banks... and then I sobered as I thought, "Oh my gosh a huge audience is eating up every word and believing this now." Living off grid is wonderful, it works, it can be attained affordably. "Off grid homesteaders have been adding conservative pundits to their herds lately. Just one talk show host provides a nearly 1 kilowatt daily from the thermal and wind energy that comes from their incessant babbling (another .5 kilowatts if you flare the methane they emit from both ends)." Well, with October here, we are pretty much done with winter preparation for weeks of snow off grid (in case it ever happens, as we are rural we just like to be prepared). Our woodshed is full, our pantry stocked, so bring on the snow! Er. Ok that's not happening any time soon so we might as well go outside and play. Now don't forget we have MINIMAL solar panel systems. As you can see in the pictures, we have a mere FOUR panels vs. the usual rooftop filled with solar. solar panels on the right. In the summer, the solar hot water showers are piping hot. In winter, we heat water on the cook stove and pour it into a Big Kahuna Portable Shower which works really well but not as perfectly as an on-grid house. As I often say, living off grid is like sailing and living on a boat. So it's no surprise we often find off grid solutions for our prefab house from those who sail. "The Atwood EHM11 performs reliably assuring customer satisfaction and full use of hot water benefits designed in your pleasure boat and rv. It was designed not only to heat water quickly and efficiently but also deliver every ounce of usable hot water from the tank. One of the features of the EHM11 is the built-in heat exchanger which is designed for the water heater's capacity resulting in heat up times superior to competitive models." "Atwood water heaters have been designed not only to heat water quickly and efficiently, but to also deliver every ounce of usable hot water possible from the tank. Atwood water heaters perform reliably, assuring customer satisfaction and full use of hot water benefits designed in your pleasure boats. 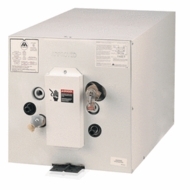 All 110V marine water heaters have a recovery rate of 8.2 gallons per hour. " I'll report back, in coming weeks. "Just four days before the U.S. Vice Presidential Debate on Longwood’s campus, more than 600 middle and high-school students gathered on Longwood’s campus to receive both the inspiration and tools to get engaged in the political process. In a setting resonant with history, and where more history is set to be made on Tuesday, they learned how young people can use the levers of democracy and citizenship to change the world – from community involvement to voter registration to leadership in the classroom." We toured the Moton Museum where little kids (LITTLE KIDS!) of 12 years old and younger made history with 16 year old Barbara Johns striking for equal school facilities and textbooks. We heard from those children, now grown, about what it was like segregation, integration, and how they navigated their own educational path. "Dreamed by 16-year-old Barbara Johns, the 1951 Moton Student Strike produced three-fourths of the plaintiffs in Brown v. Board of Education (1954), the landmark Supreme Court decision desegregating U.S. schools. From 1959 to 1964 Prince Edward County closed their public schools to avoid integration. The Supreme Court in Griffin v. Prince Edward (1964) ordered schools to reopen, declaring “the time for mere ‘deliberate speed’ has run out.”"
The homeschool kids loved being in a REAL SCHOOL CAFETERIA. This weekend we wished HAPPY 14th BIRTHDAY to my sweet Pip 1, who loved his blaze orange hat WITH A LIGHT, and new targets... I have loved watching him mature as his body catches up with his brain... he is kind, thoughtful, and ever inquisitive. A homemade felt version of Cornbread! ...with a card of him riding Zena. They spent the afternoon playing with the new targets!